Click the image above to view the draft map of existing and proposed rustic roads. 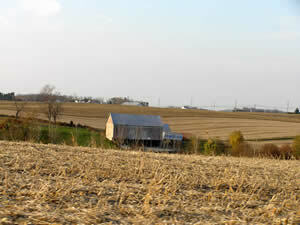 Rustic roads are historic and scenic roadways that reflect the agricultural character and rural origins of the County. Preservation of rustic roads must be achieved by retaining certain physical features of rustic roads and by certain right-of-way maintenance procedures. Rustic and Exceptional rustic roads are preserved under the Rustic Roads Program, which provides a system for evaluating, protecting, and enhancing these scenic roadways. The program includes 98 roads. These roads are listed and described in the Rustic Roads Functional Master Plans and in other area Master Plans as shown below. Click here for the latest draft list of rustic roads and the corresponding map. Heritage Montgomery has an interactive map of heritage sites and has a brochure, Community Cornerstones: A Selection of Historic African American Churches in Montgomery County Maryland. Many of these sites are in the Agricultural Reserve and are on Rustic Roads. 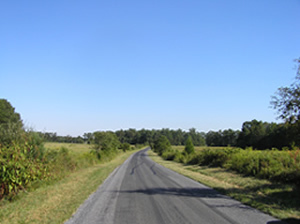 Two Maryland Scenic Byways are located in Montgomery County, and they include several Rustic Roads. Travel the C&O Canal and the Antietam Campaign trails. Montgomery Countryside Alliance produces an Agricultural Reserve Guide and interactive map that covers local farms, orchards, parks, equestrian facilities, historic sites, museums, and even two historic general stores. Countryside Artisans of Maryland host Studio Tour Days several times per year featuring paintings, prints, fiber, furniture, sculpture, and more. 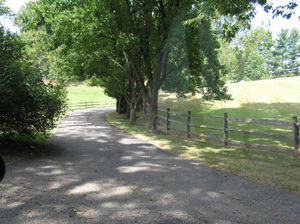 A number of the studios are located on Rustic Roads. 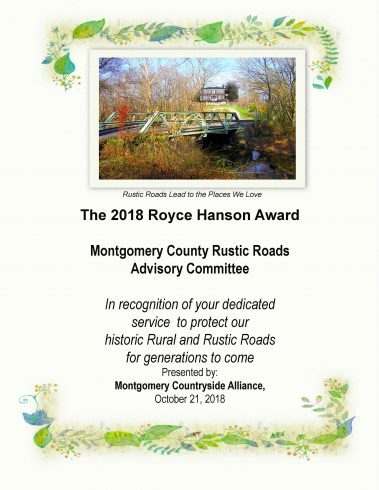 the Rustic Roads Advisory Committee on being selected for the 2018 Royce Hanson Award by Montgomery Countryside Alliance. The award recognizes the committee’s outstanding commitment toward protection of the Agricultural Reserve. View the presentation. March 2018: The RRAC thanks outgoing staff coordinator Mike Knapp and welcomes incoming staff coordinator Atiq Panjshiri. April 2017: View the NBC4 Meet Your Street segment on Montevideo Road, an exceptional rustic road, and the Rustic Roads program. April 2017: Read the article about Rustic Roads from the Potomac Almanac. 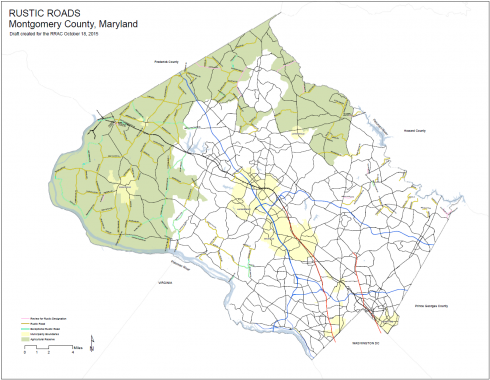 March 2017: The RRAC is pleased to release their report, 20 Years of Rustic Roads: Status and reflections on the Montgomery County Rustic Roads Program, 1996-2016. This report includes the committee’s biannual report covering 2014-2016. June 2016: For her senior project, Poolesville High School Global Ecology student Anelia Slavoff researched the history of Allnutt Road, which has been nominated for inclusion in the rustic roads program by the residents of the road. The RRAC greatly appreciates the excellent report Anelia wrote for the committee and congratulates her for her award winning paper. January 2016: Congratulations to RRAC member Christopher Marston and his co-executive editor, Justine Christianson, on the publication of their new book, Covered Bridges and the Birth of American Engineering. The book is published by the National Park Service’s Historic American Engineering Record. On October 19, 2015, the RRAC presented a status report to the County Council’s Committee on Transportation, Infrastructure, Energy & Environment. View the presentation here. Have you ever wondered how to find a rustic road? The new brown street name signs will make it easy to tell. In 2012, the RRAC and MCDOT worked together to create a special street name sign for rustic roads with a brown background. As you drive these roads, you should be starting to see the transition. 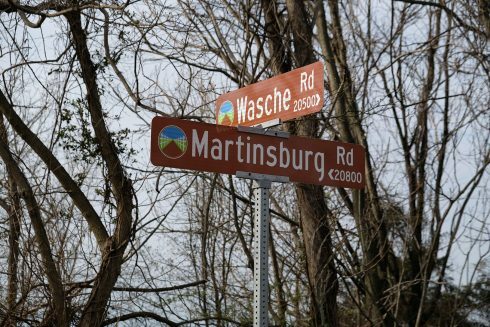 It will take some time to change all of the signs, so for now, you will see both brown and green street name signs for roads in the Rustic Roads Program. In time, all of the rustic and exceptional rustic roads will be identified by their brown street name signs. November 2014: Staff briefed the Planning Board on the Master Plan of Highways and Transitways Update on November 20, 2014 (staff report here). Descriptions of 28 current rustic roads and consideration of 13 roads that have been nominated for addition to the rustic roads program are included in this update. Community comments may be sent to Leslie Saville and Michael Knapp (contact info below). This document provides information about the program, its intent, history and regulations, as well as descriptions of the initial 66 roads designated under the program. The Rustic Roads Program is overseen by the Rustic Roads Advisory Committee (RRAC) and three agencies. The RRAC is comprised of seven citizen members who are appointed by the County Executive; they review and advise the County Executive, County Council, Planning Board, Department of Transportation, Department of Permitting Services and other county agencies on matters concerning rustic roads. Members review and comment upon roadway classifications, policies, regulations, and promote public awareness of the Rustic Roads Program. The RRAC meets six or more times a year. Meetings are normally held on the 4th Thursday of the month at 6:00 p.m. in the 9th Floor Conference Room of the Executive Office Building, 101 Monroe Street, Rockville, MD. After 6:00 pm, use the cafeteria entry on the south side of the building. Meetings are open to the public. The anticipated meeting schedule is below. To confirm the meeting will be held, to confirm the location, or to have an item placed on the agenda, please call the RRAC Staff Coordinator, Atiq Panjshiri, 240-777-6352. Maryland Scenic Byways (the Chesapeake & Ohio Canal and Antietam Campaign follow several rustic roads). The Scenic Byways Resource Protection Application shows the Byways corridors, resources and more.